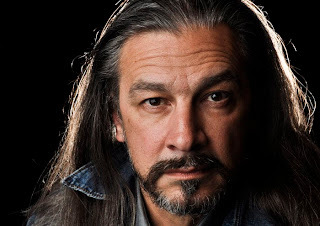 Greer Grimsley has sung the role of Wotan all over the world, but he first sang it here in Seattle in 2005, winning the company's Artist of the Year Award for his performance. He’s back for his third Seattle Ring and a tenth summer in Seattle. He spoke with us about the challenges of his role, how this production has been a family affair, and how singing Wagner in Seattle provided a turning point in his career. You have now sung Wotan all over the world. What does this Ring mean to you? I love this Ring. Since it is the first Ring that I ever did, it has huge sentimental value for me. I also believe in the production. I believe in the storytelling that we do. For all of its wonderful music, the Ring is also very text driven. The care that’s given to the text and to making sure that all intentions and relationships are clear—you don’t get that in all productions. That keeps me coming back. Plus, I’m just so happy to be back in Seattle. I consider Seattle one of my home spots in the world. When did it occur to you that someday you’d sing Wotan? 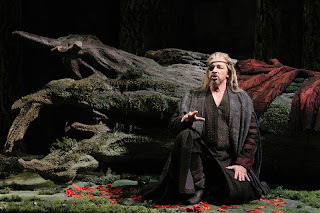 I had lots of folks telling me, ‘You might end up doing this,’ but it wasn’t until Speight gave me the opportunity to sing Telramund in Lohengrin. Prior to that, I was a victim somewhat of the very conservative nature of musical-vocal thinking in the United States: that you have to sing Mozart until you’re 45 and then you can do heavier things. That’s not how my voice worked. Early in my career on I was having trouble finding direction because that didn’t suit what I could do. It wasn’t until I sang my first John the Baptist that things clarified for me in terms of where I should find my niche in the opera business. Then that opened up other opportunities. And I would have to say, yes, of course I started thinking about Wotan, but I was thinking about other things as well, such as just getting hired. When Speight did ask me to do Wotan, I was ready to be asked. It happened exactly at the right time. 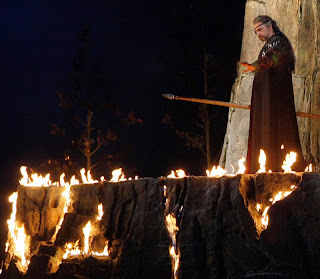 Do you find it easy to relate to Wotan? Are there moments of his long journey that are more or less challenging to connect with? That’s a good question. As an actor you always bring something of yourself to the role. In the realm of Wotan’s mishaps and adventures there’s the sense of someone trying to fix something, not having enough information, and being bound in at every turn. I think we’ve all felt that and can relate to that. I know he is a god, but his experience that’s shared with the audience through all of this is very human. You can identify with every bit of it. He has the ability to kill someone with just a gesture, as he does in Walküre, but that’s the only time where you see his godhood. Saying good-bye to his daughter forever, seeing his son killed—those are hugely human conditions and emotions. For instance, being able to make bargains and treaties with people—sometimes not telling the whole truth to get the best deal—that was part of survival and success when these stories were first created. Do you like appearing in Götterdämmerung? Have you made that appearance in other cycles? This is the only one, and I have to say, yes, I do enjoy that. It does put a nice bit of punctuation to the character. 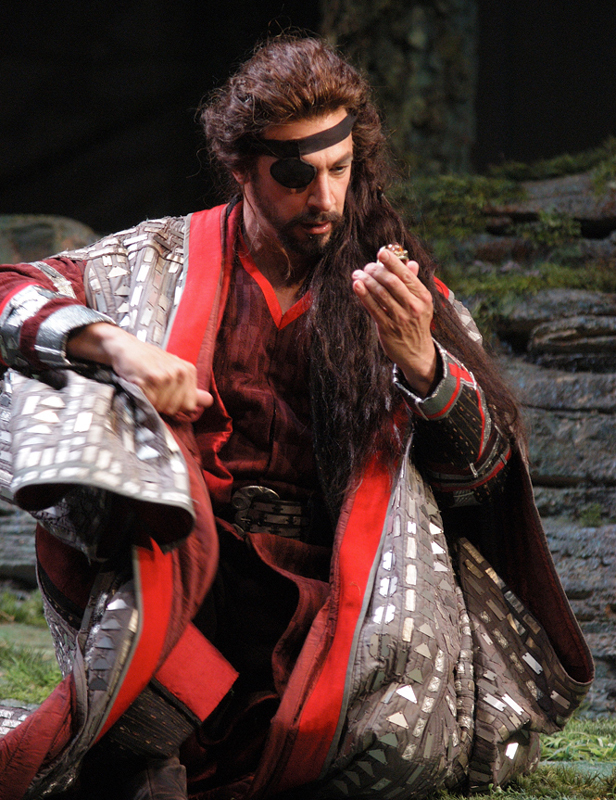 I think everyone who does this role will say that you get a chance to develop a character through three operas. There’s not anything else in the repertoire that I can think of where you get a chance to do that. Could you share a favorite memory associated with this production? When I first did Wotan, my daughter was a Nibelung, and my wife was a Valkyrie. Luretta is here again as a Valkyrie, so having the whole family in this is quite enjoyable. 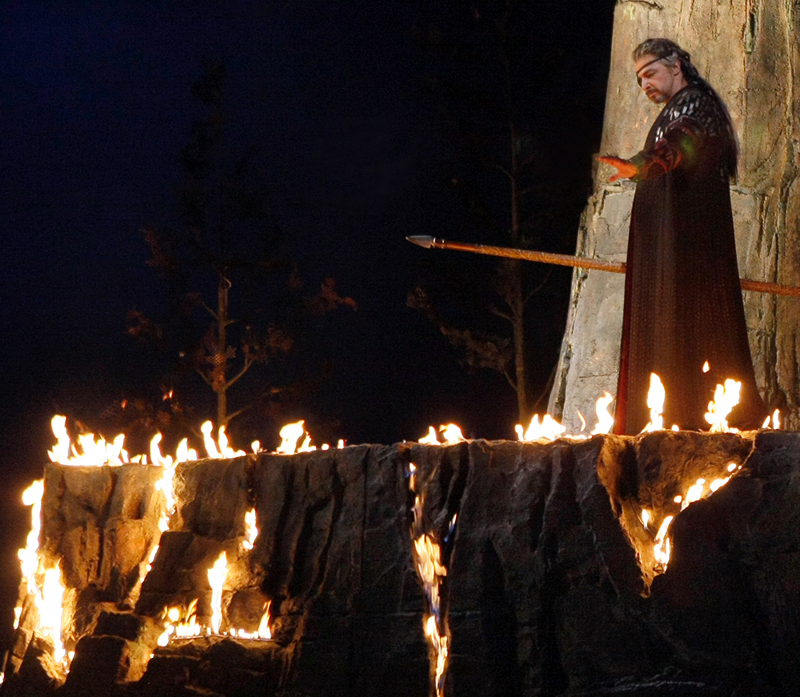 What would you say is the most challenging aspect of Wotan? I think everybody would say stamina. And that’s something you can help yourself with. In Rheingold he’s much more youthful and in Walküre there’s a heavy weight on Wotan, and there’s a sense of resolve that comes in. But people shouldn’t even notice that he’s different—that’s the hard part. Why do you choose not to mark in rehearsal? Actually, I’ve talked with some colleagues about this, and especially in this repertoire it’s sometimes easier to sing than to mark. It takes more maneuvering and thought process as opposed to just singing it. When you mark you think, ‘Ok, how am I going to do this? Am I going to do this an octave lower?” And it sort of takes away from the dramatic part of it. In many ways, because the music is now a part of me, this kind of rehearsal frees me to explore other avenues. It’s become a very dear friend. The first time I did it my intent was to do the best job I could do. But I didn’t want it to be evident that it was my first time doing it. When Speight asked me, I had a year to get it done, so I cancelled some jobs and through translating and working on the music, I just made sure it was as close to second nature as possible before I even showed up here. 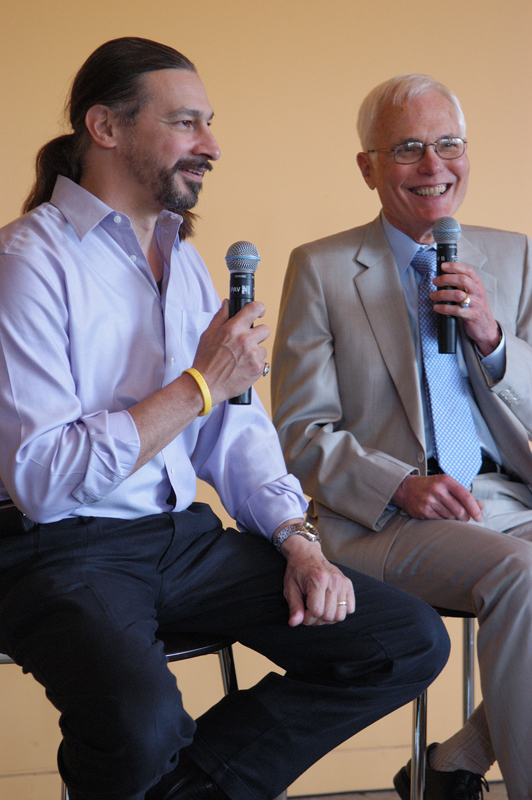 What has it been like to work with Stephen Wadsworth and Asher Fisch? I’ve known Asher for a very long time and love working with him. We understand each other when he’s conducting, and the same with Stephen. He gives us the freedom to explore, and he helps with specifics as well. Every time you do something like this you look for different ways to approach it. Tito Gobbi, who sang Scarpia thousands of times, wrote in his book that every time he performed that role he found something new. I read that as a young singer, and that’s the way I look at any role. I look for something new, maybe something I missed or I can do better. Do you have any thoughts about Speight and this being his final Ring? I’m hugely sad about that. Speight has been responsible for me being in this repertoire and tapping me to do my first Wagner. Lohengrin in 1994 started me on a wonderful path.